My first time in a formula gloria, my first time at the nurburgring! The schedule of the new generation formula gloria series was set-up with a lot of tracktime for the drivers: on friday two free training sessions (each 30 minutes), saturday a 20 min. qualifying and a 25 min. race 1. On sunday again a 20 min. qualifying and the 25 min. race 2. 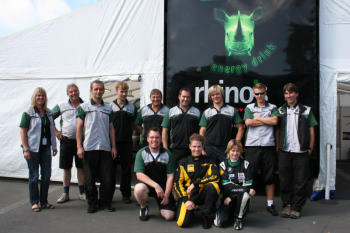 With Ingo Leipert and his professional team rhino's I managed to improve everytime I was on the track. On friday I used the free practice sessions to get a feeling for the car and to find a fast line on the nurburgring. I like the racetrack and now I really know why it is one of the best known racetracks worldwide. The next day I could qualify one position behind my teammate Christian Wangard. I had bad luck early in the race1, got on the dirty side of the track and spon, but with a little effort I was able to gain my former position again. On sunday I was full of motivation to show that I could drive this track as fast as the italian guys. But a good start got me a little bit too excited, and I spon again. I was still very motivated and improved almost every lap during the rest of the race. After this weekend at the nurburging with the team rhinos leipert, the new experience in the formula gloria car and getting to know Mr. Enrico Glorioso I can say it was a lot of fun for me! The team was just great, and I can barely wait for the next race to work with them. The next race of the formula gloria will be in Oschersleben (Germany), September 29. and 30 - where also the final race of the Top10 will be held on the same day.